We all go there occasionally. Some more frequently than others. Where, or rather what, am I talking about? The dreaded Negative Thoughts. And boy, they can really make you feel down in the dumps and give you the blues, can’t they? Of course, we’re not able to avoid negative thoughts all our lives. “Positive thinking” (whatever that is) isn’t possible all of the time. I mean, the realities of life include difficulties and even tragedies, and it’s not always possible or even appropriate, to feel positive. Grief, anger and acknowledgement of loss are part of the natural range of human emotions and have their place in our lives. Often, they’re the trigger for a significant learning process. That’s a good thing, right? What is important is that we don’t call our attention to them unnecessarily, or dwell on them longer than is appropriate. Gil Boyne, Self-Hypnosis: Key To Your Inner Power, p. 82. 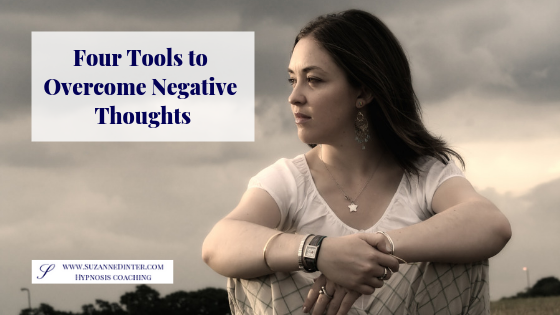 So, what do you do when you have negative thoughts? Do you just let yourself go deeper and deeper until you get stuck in the dungeons of your mind? Or do you pretend everything’s fine on the outside but deep down you’re tearing up inside? How do you get yourself out of the hole once you find yourself in it and you’re ready to climb out? I literally have them written down on a piece of paper in a prominent place so that I can access them when I want to get myself out of a fug. 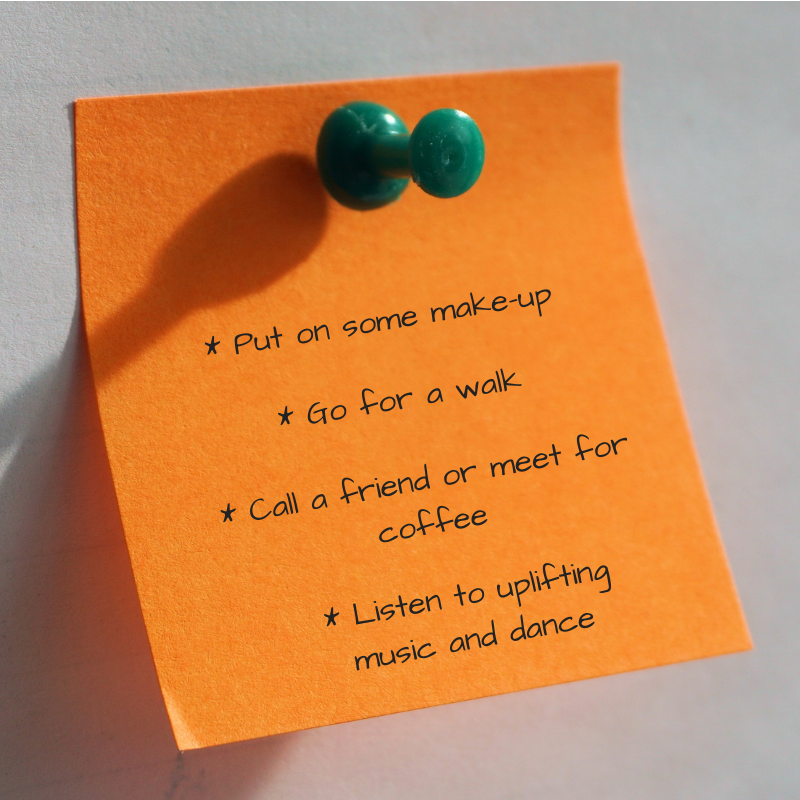 I mean, when I’m down, I sometimes forget the simplest of things that make me feel better again! Is that the same for you? Journaling – I write it all down, as it comes and in no particular order. It’s usually a mess but it helps to find clarity in my mind that way. Meditation – I think of a question I want an answer to, take few deep breaths, close my eyes and concentrate on the words inhale and exhale for ten minutes. Tapping (EFT) – I use this method quite rudimentarily. I simply say out loud, “Even though I (insert negative thought, pattern, belief about yourself), I deeply and completely love and accept myself.” Then I see what feelings come up and tap on those until can feel the negativity lifting. Hypnotic programming – This is the most powerful one, I find. I have different audios on a variety of topics. Hypnotic programming replaces any negative thoughts with powerful, positive ones deep down in your subconscious mind. Hypnotic programming is uplifting and boosts my energy levels to new heights! It calms me down, gives me hope and reminds me of my innate qualities. 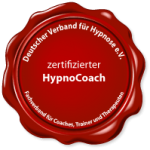 Hypnotic programming is always part of a hypnosis coaching session. I send my clients their own personal recording to listen to daily after the session. This strengthens the hypnotic process that was set in motion in the session. And if you sign up for my newsletter below, you get to experience hypnotic programming with my thank you gift of a hypnotic deep relaxation audio download. You can choose to let the negative thoughts rule your life, or you can choose the positive ones and have greater success, greater health and greater fulfilment in life. Which one is it going to be? If you would like some help in turning your thoughts around, please book a free, initial consultation call here.